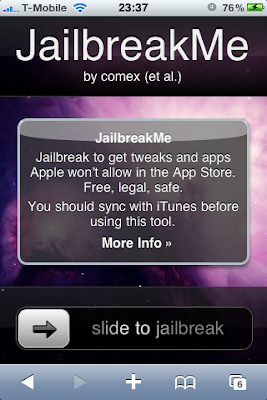 With the new jailbreak from comex, all devices that are running firmware up to and including iOS 4.0.1 can now be jailbroken. For more details, visit www.jailbreakme.com with your desktop webbrowser first and when you are ready to jailbreak your device, open up Safari on your device , then visit the www.jailbreakme.com site and follow instructions. Your device will be jailbroken in a few minutes! As such, all devices will now work with the Orange Gadgets iGPS360 module and this includes the latest third generation iPod touch models (MC models) as well as the iPad running firmware 3.2.1 (both WiFi and WiFi+3G) and the iPhone 4, running iOS 4.x. And make sure not to forget to back up your SHSH blobs so you will always be able to revert back to an older firmware if you accidentally upgrade. If you wish to know how to do this, visit the Firmware Umbrella.